" To know his art is to know a friend. 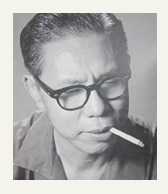 Although my personal acquaintance with Chuah Thean Teng spans hardly a decade, because I have been able to study so many of his works, I feel I know Teng better than many of my other friends. I am delighted and I consider myself privileged to be able to put down a few words in this brief introduction to Teng’s book about his batek art. Some people may assert that pictures need no words and good art needs no introduction. However, even the greatest artists known to man, have been the subject of written and spoken appreciation. Therefore, within our modest scale some introduction should not be considered out of place. I will try to answer two questions . " © 2012 Yahong Art Gallery Sdn. Bhd. All Right Reserved. Web Design by Kenny H.